Mr. Zinsser urged writers to express themselves concisely. 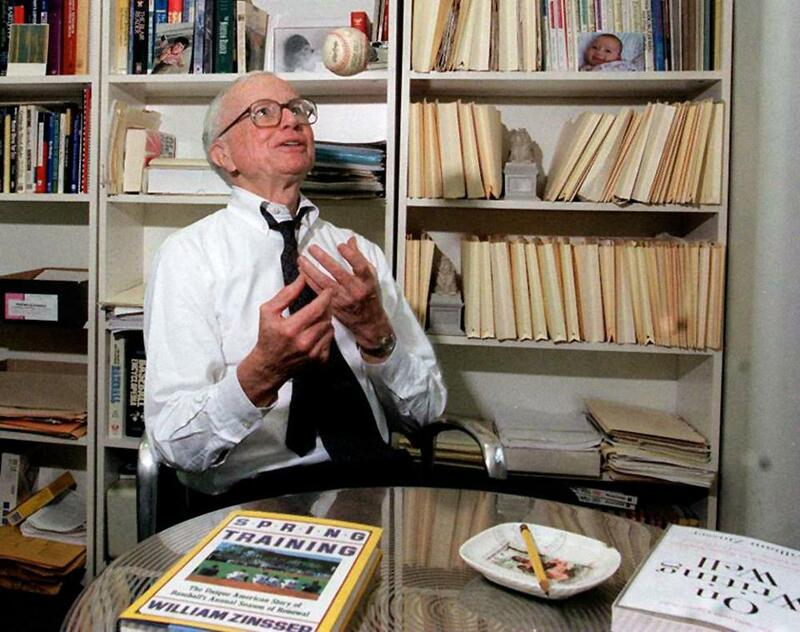 NEW YORK — William Zinsser, a writer, editor, and teacher whose book “On Writing Well” sold more than 1.5 million copies by employing his literary craftsmanship to urge clarity, simplicity, brevity, and humanity, died Tuesday at his home in Manhattan. He was 92. His wife of almost 60 years, Caroline Fraser Zinsser, confirmed the death. Mr. Zinsser wrote 19 books, taught at Yale and elsewhere, was drama editor and movie critic for the New York Herald Tribune and executive editor of the Book-of-the-Month Club. But it was his role as an arbiter of good writing that resonated widely and deeply. “On Writing Well,” first published by Harper & Row in 1976, has gone through repeated editions, at least four of which were substantially revised to include subjects such as new technologies (the word processor) and new demographic trends (more writers from other cultural traditions). It became a book that editors and teachers encouraged writers to reread annually in the manner of another classic on the craft of writing, “The Elements of Style,” by William Strunk and E.B. White. Mr. Zinsser went beyond that earlier book’s admonitions on writerly dos and don’ts; he used his professional experience to immerse readers in the tribulations of authorship, even subconscious ones. His advice was straightforward: Write clearly. Guard the message. Avoid jargon and big words. Use active verbs. Make the reader think you enjoyed writing the piece. “There’s not much to be said about the period except that most writers don’t reach it soon enough,” he wrote. “Abraham Lincoln and Winston Churchill rode to glory on the back of the strong declarative sentence,” he wrote in “Writing to Learn: How to Write and Think Clearly about Any Subject at All” (1988). It added up to more fun than some readers expected. “You actually enjoy reading it, rather than feeling like you’re eating your spinach,” Ronald Kovach wrote of a Mr. Zinsser book in The Writer magazine in 2002. William Knowlton Zinsser was born in Manhattan. He escaped his father’s urgings to join the family shellac business but could not escape his mother’s counsel that being cheerful was a Christian obligation. “It is because of her that I am cursed with optimism,” he said in his autobiography. He attended Deerfield Academy in Massachusetts, where he said he was “intoxicated” by the scent of printer’s ink as editor of the school paper. His Princeton education was interrupted by World War II. After the fighting ended, he was able to take art history courses at a college the Army had set up in Florence. On his return to Princeton, he convinced the dean that his firsthand experience visiting Italy’s art treasures deserved Princeton credit. In a manner typical of his writing, Mr. Zinsser used this episode to make a philosophical point about America’s obsession with winning and losing. “Don’t be afraid to fail,” he declared. He described his own life as a chain of disruptions. He lost his beloved first job at The Herald Tribune when the paper closed in 1966. He left New York for New Haven to teach at Yale, something completely new. He left Yale for the Book-of-the-Month Club, another uprooting. He was nervous, he said, but things worked out. He worked for 13 years at The Herald Tribune as feature writer, drama editor, and movie critic, glorying in Broadway opening nights and junkets to Hollywood. Then came 11 years as a freelance writer, churning out magazine articles as well as many books. One, “Pop Goes America” (1966), analyzed what was meant by the word “pop” (an enjoyment of the superficial, he explained). Mr. Zinsser wrote that the loneliness of the freelance writer’s life influenced him to turn to teaching. When he arrived at Yale in 1970, 170 students applied to take his course, “Nonfiction Workshop,” which had room for 20. The new teacher guessed that the course’s popularity stemmed in part from a desperation to learn the grammar and syntax that permissive English teachers had ignored. Yale quickly hired more journalists to teach writing fundamentals, and the Yale English department added writing instruction to its curriculum. Mr. Zinsser also edited Yale Alumni Magazine and was master of Branford College, one of Yale’s 12 undergraduate residential colleges. “On Writing Well” grew out of his teaching at Yale. Writing it was his wife’s idea, he said. They married in October 1955. Mark Singer, a staff writer for The New Yorker, took Mr. Zinsser’s course at Yale and has reread his book several times. Singer praised Mr. Zinsser for guiding aspiring writers on the arduous path of finding their own voice. “He certainly helped people avoid the pitfalls of trying to sound like something they’re not,” he said. Christopher Buckley, the political satirist, said he senses Mr. Zinsser perched on his shoulder like a parrot when he writes. The parrot always says to look for needless verbiage. Mr. Zinsser frequently received letters from less famous writers, including the night manager at a resort campground in Orlando who had recently become editor of the camp newsletter. Mr. Zinsser worked for the Book-of-the-Month Club for eight years. He later taught writing at the New School in New York. In his late 80s he wrote a blog on popular culture, the craft of writing and the arts for the website of The American Scholar that won a National Magazine Award for digital commentary. Mr. Zinsser published books steadily, confirming his self-definition: “a writer who does some teaching,” not vice versa. Besides writing about writing (he published books on writing memoirs, political novels, children’s books, and travel books), he followed his advice and wrote about things that interested him, from baseball to songwriters to resonant American places, like Yellowstone National Park and Pearl Harbor. Besides his wife, with whom he shared another home, in Niantic, Conn., Mr. Zinsser leaves their son, John; their daughter, Amy; and four grandchildren.